In this episode, Jon interviews Chelsea Marshall and Mary Dauterman about their book, What Are We Even Doing With Our Lives? In this a charming, satirical “children’s” book, BuzzFeed’s animals editor turned video producer and acclaimed art director/illustrator poke fun at our contemporary, hyper-connected, and often mundane millennial age and the absurdities of the #blessed time and place in which we all now live. Welcome to “Digi Valley,” the epitome of twenty-first-century urban life! The animal-people who call it home do cool things: life coach, cat landlord, baby DJ teacher, app developer, iPhone photographer, new media consultant, beauty blogger, and, of course, freelancer. On the street, in the coffee shop, at the farmer’s market, or the local vegan café, you’ll meet new friends like Frances and Sadie, Freelance Frank, Realtor Rick, and Bethany the Beauty Blogger as they bike, drive, bus, hoverboard, and Uber their way around town–or just sit and enjoy a latte while doing important things on their devices. Everybody in Digi Valley is very, very busy–texting, tweeting, video chatting, sending selfies, swiping for dates, and binging on their favorite shows. Whether you’re looking for a job at the latest media startup or want to publish your own web series, this urban mecca has something for everyone. And with the emotionally sensitive, tech-friendly Digi Valley Elementary School, it’s a great place to raise kids too! In What Are We Even Doing With Our Lives? 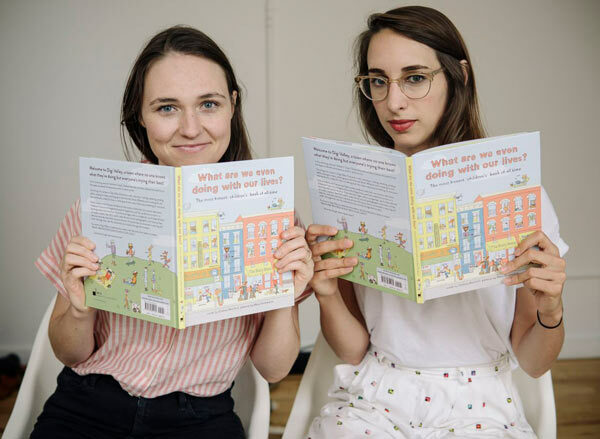 Chelsea Marshall and Mary Dauterman have created an authentic fictional world that illuminates the funny, silly, earnest experience of millennial life. But watch out when the unthinkable happens–the internet goes down! Filled with dozens of illustrated spreads, What Are We Even Doing With Our Lives? is the most honest children’s book for all ages ever written . . . like seriously. Chelsea Marshall is the lead animals editor at BuzzFeed, where her written and video content has amassed hundreds of millions of views (yes, indeed, it is truly viral). Chelsea also has a history in television, having worked for The Colbert Report, SNL, and Late Night with Jimmy Fallon. In addition to running the successful animal section at BuzzFeed, she travels the country doing improv, hosting shows with headliners like SNL’s Michael Che, and leading BuzzFeed’s humor-writing workshops. She has been profiled by GQ and Time magazine for her humor writing and flown across the country to lead a panel for CatCon and interview a surfing potbelly pig. She has a sassy shiba named Hadley Bean who has a beautiful face. Mary Dauterman is a Brooklyn based creative who works in a variety of mediums. She is the author/illustrator of What Are We Even Doing With Our Lives? (Dey Street, 2017) and Dirty Library (Running Press, 2014), two sarcastic picture books she made with two of her best buds.